Surrounded on all four sides by encroaching suburban development, the 1875 William Pfluger House was the home to five generations of the family. William Pfluger, a German immigrant and one of the founding fathers of the city of Pflugerville, was a rancher, banker, and cotton gin owner. 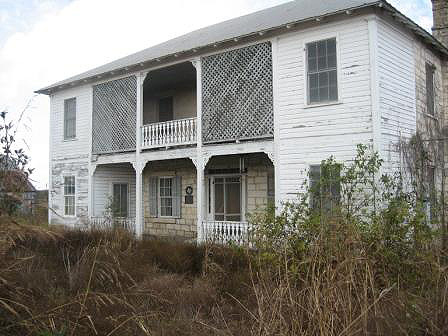 The house was constructed in local limestone and expanded over a two year period to accommodate his eight children. Located about 15 miles north of Austin, Pflugerville has doubled in size in the past 10 years. As the Central Texas region continues to outpace the state and nation in growth, the community of Pflugerville is struggling to keep ties with its past and accommodate the future. Concerned citizens, the city and the school district support the concept of restoring the property however several attempts to provide funds and to find a solution have failed. If funding and full community support can not come together to create a successful plan, the story of Pflugerville’s roots will be lost to more parking lots and big-box stores.